Ready to Roll Mobile Activity Center is rated 4.9 out of 5 by 25. What has four wheels and endless fun? The Bright Starts Ready to Roll™ Mobile Activity Center! Right before baby’s eyes is a train track where she can choo-choo her way into circles of laughter, and the toy train detaches for floor play too! Need to move to the living room, or prep a meal in the kitchen? You can move your baby without disrupting playtime! This activity center is made on wheels so you can leave baby in place while you scoot her from room to room. And as baby grows up, so does baby’s activity center. 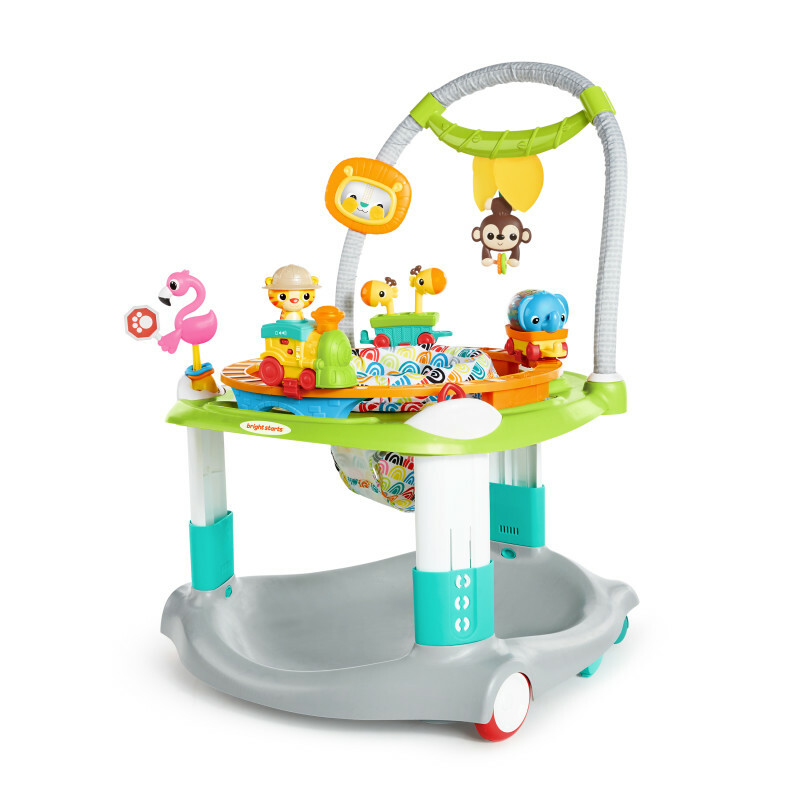 Adjust the activity saucer to 3 different heights, so there’s always room for her little toes. When playtime is over, don’t worry about all the heavy lifting. You can move this zany zoo from room to room with a simple pull of the handle. Giggles in all directions with 360 degrees of FUN! Dimension (in) 28.25" x 28.25" x 34"
Rated 5 out of 5 by Bree from Love this! Whoever designed this activity center deserves an award! I remember the old stationary activity centers were often heavy and not easy to move at all, especially with a baby. But the mobile activity center allowed for easy access and mobility which I absolutely loved! Rated 5 out of 5 by TiffanyDupard83 from Ready to Roll Mobile Activity Center This is absolutely the best product. I love this activity center. It’s loaded with fun and entertainment. Rated 5 out of 5 by lilannie from Ready to Roll The Ready to Roll Mobile Activity Center kept my little one busy. My baby loves it and enjoys playing with it. I’m glad I got to try this and I would recommend it to other parents. Rated 5 out of 5 by Mari from Keeps baby occupied I love this activity center, I have hard wood floors and this is perfect for rolling from room to room, from kitchen to living room to hallway when I have to go to the bathroom lol this comes in handy. And it’s not boring either, the baby seems to like it, she is 6 months old and stays busy in it. It’s easy to clean, and easy to adjust for when other babies visit and their moms arms need a break. Rated 5 out of 5 by vmianava from JUST WOW!!! AMAZING!!! Wow, this is a MUST HAVE once baby starts sitting up. Better than a jumperoo since baby is stationary but can be transported from room to room. Baby never loses interest in the toys...and train is the cutest! Rated 5 out of 5 by Steponme from This has it all! This activity center is amazing. So man lights and sounds to entertain baby but also things to grab at, spin, push and pull. Very interactive! The spinning seat allows baby to turn all the way around and access all of the toys. The train can come off the track and be played with on the floor even after baby out grows the center. These activity centers are usually a pain to move since they are so big and round its hard to get a good hold on it, but with the one a single push of a button and it is up and moving with ease, plus it has locks to keep baby from going anywhere when you don't want them to. A really fun center for any baby out there! Rated 4 out of 5 by HeatherS from Amazing toys! Convenient to use! Really love this Activity Center! It was so great to be able to move my son around the house as I did chores. Its such a big bonus that the toys it comes with are so colorful, engaging, and are even removable (maybe too easily - the giraffe went flying across the room) and that is huge! I love the fact that he now has three little train cars he can push around once he's too big for this. There was one downside. The wheels on the opposite side would only allow me to pull him once he was in it. They wouldn't allow me to push him, so when I needed to turn him the other direction, I had to lift and pivot. I think he might be a bit too plump (21 lbs) and weighed down the wheels. *I was given this free of charge as a part of the Kids II Friends and Family Program. All opinions are my own. Rated 5 out of 5 by Kat052327 from entertaining toys, Sturdy, Convenient the feature that im most excited about was the ROLL feature where i can drag and roll it anywhere in the house, making it possible for me to do chores, cook and clean. My son used to refuse being put in his Play pen, but with the mobile activity he enjoys playing with the toys because its interactive and colorful! there are lots of toys to play with, he cant go anywhere like a typical walker, this us more like a bouncer but the ability to drag and roll it with you. The hight adjustment is very helpful, because as he grows he can still sit in it. I can also retract the toys and let him play with them. Overall this is a must to have for MOMS like me who wish to use it when i need to be in the bathroom, clean, or cook him beside you without carrying your baby. Very pleased and satisfied with the product.